Spring marks a time of new beginnings, and there’s no better beginning than welcoming a baby animal into the world! So to celebrate this season of new beginnings (and all the spring babies to come), we’re sharing all of the zoo babies we’ve welcomed over the past year! Through the Association of Zoos and Aquariums, Reptiland is part of a Species Survival Plan for many vulnerable and endangered animals. 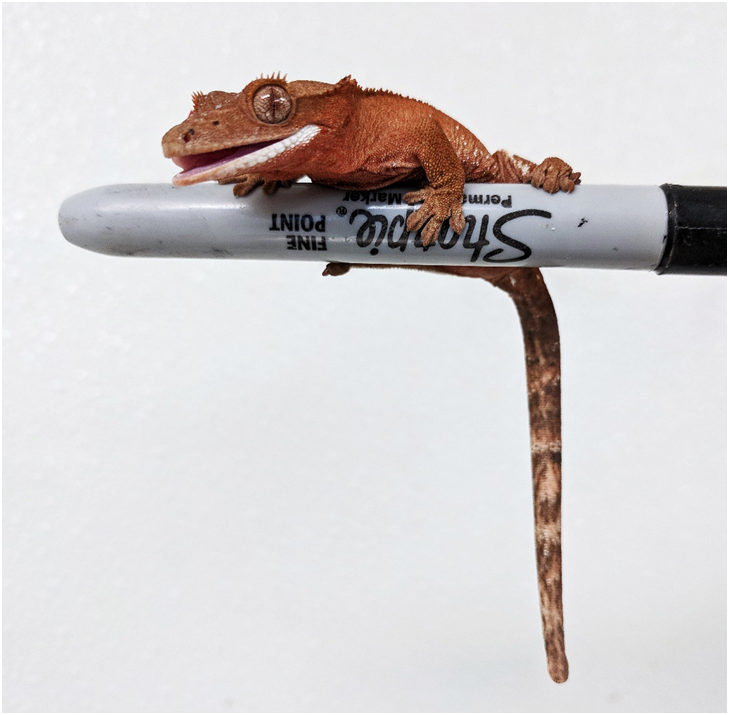 One of these, Henkel’s leaf-tailed geckos, are found on the island of Madagascar. Due to loss of habitat and collection for the pet trade, these geckos are listed as Appendix II by the Convention of International Trade in Endangered Species of Wild Fauna and Flora (CITES) which means they need to be protected or they could end up on the endangered list. We’re excited to announce that we recently hatched 13 of these beautiful geckos! Our Amazon milk frogs sure kept us busy. 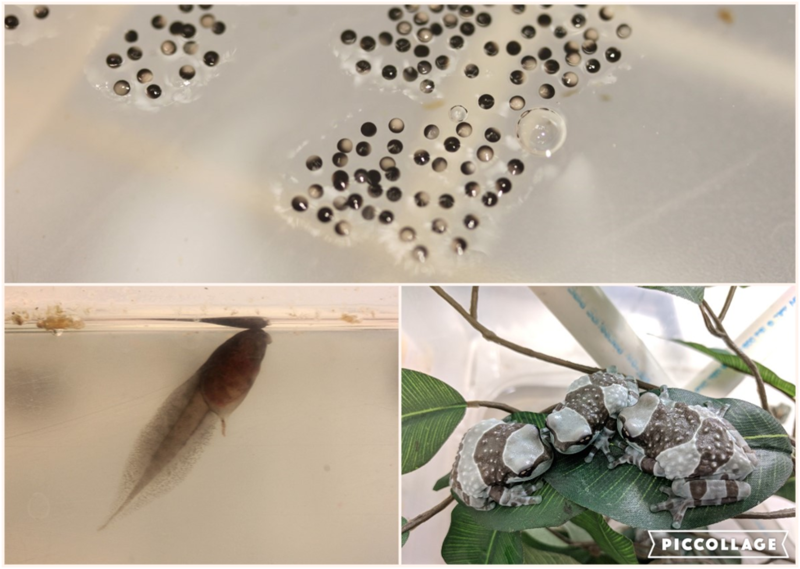 We had more than 200 tadpoles hatch over the past year! In the wild, eggs are laid in areas like tree hollows. The male will call a female over to lay her eggs which he will then fertilize. Once the tadpoles hatch, they need a food source, so the male will continue to call females over to the tree hollow to lay eggs. He won’t fertilize these clutches and instead will let his tadpoles eat them. We have many species of poison dart frogs on display at the zoo – the one pictured below is the phantasmal dart frog. Even though they’re less than an inch long, they’re by far the loudest of our poison dart frogs! The males call to the females and lead them to a bromeliad plant. The males will guard the fertilized eggs until they’re tadpoles. He will allow them to wiggle their way onto his back and will carry them to the water below. 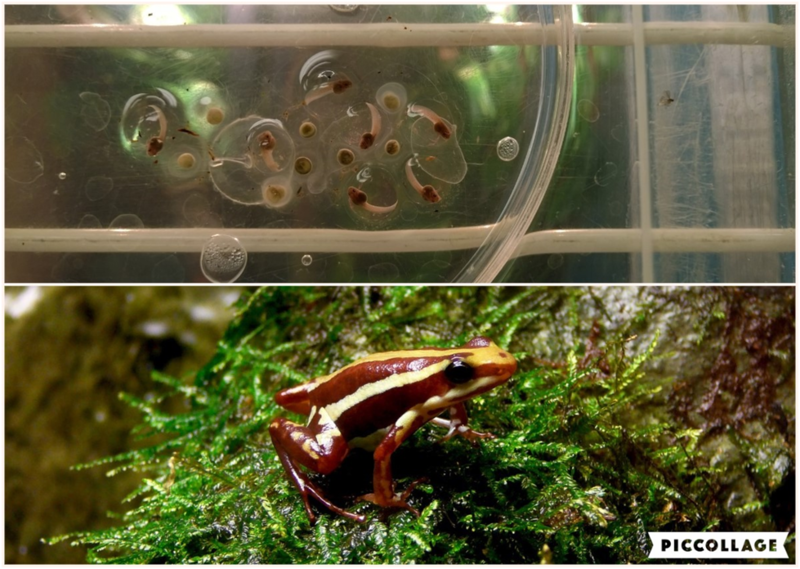 Much like the Amazon milk frogs, we had LOTS of new poison dart frogs this year! Many species of colorful day geckos live throughout Madagascar. They’re very opportunistic and eat a variety of insects, fruit, nectar, and smaller lizards. 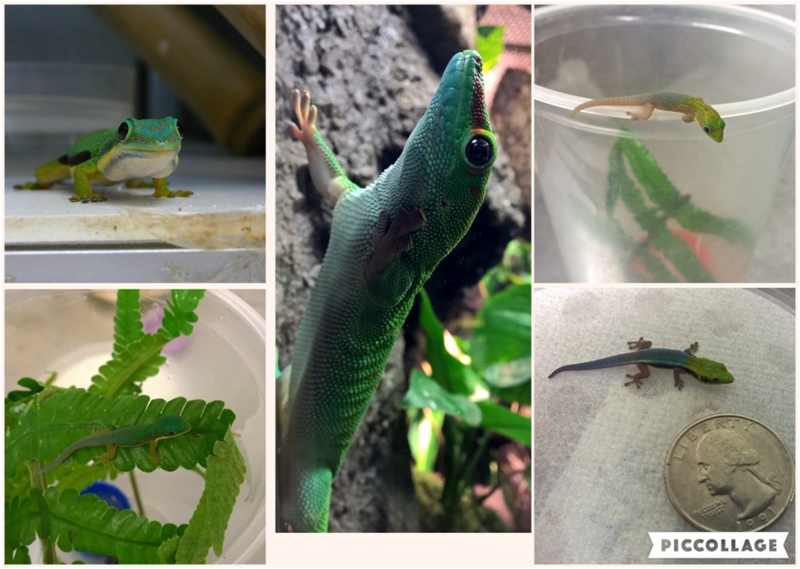 We house five species for our traveling exhibit Geckos: Tails to Toepads. Four of them are called jeweled day geckos for their small size and dazzling colors – peacock, lined, gold dust, and neon. The other species is MUCH bigger and is accurately named the giant day gecko. 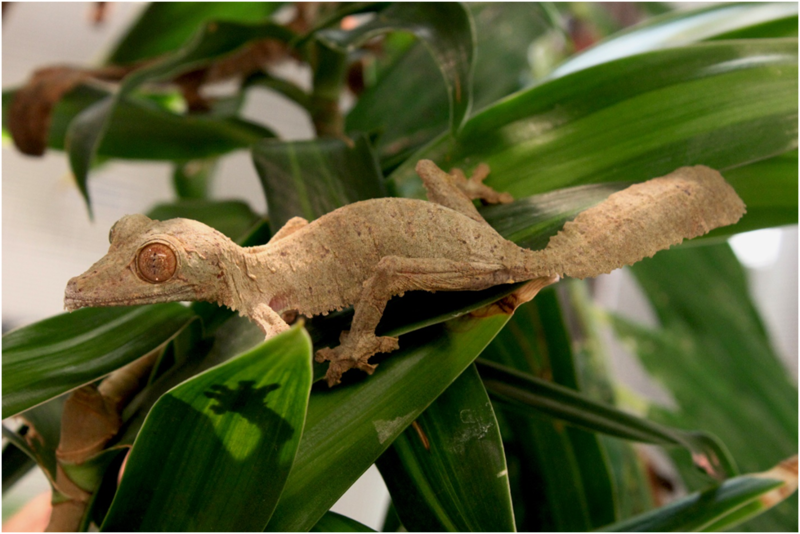 Crested geckos have become one of the most popular reptile pets over the last two decades. Incredibly, this species was thought to be extinct until they were rediscovered on their native island of New Caledonia in 1994 after a tropical storm! They’re named “crested geckos” due to hair-like structures that form a crest around their head and down their back. They also have them above their eyes which makes it look like they have eyelashes. Like most geckos, they cannot blink and must clean the transparent scale covering their eye with their tongue. We think they’re pretty cute all the time, but no one can deny how cute this tiny gecko is! 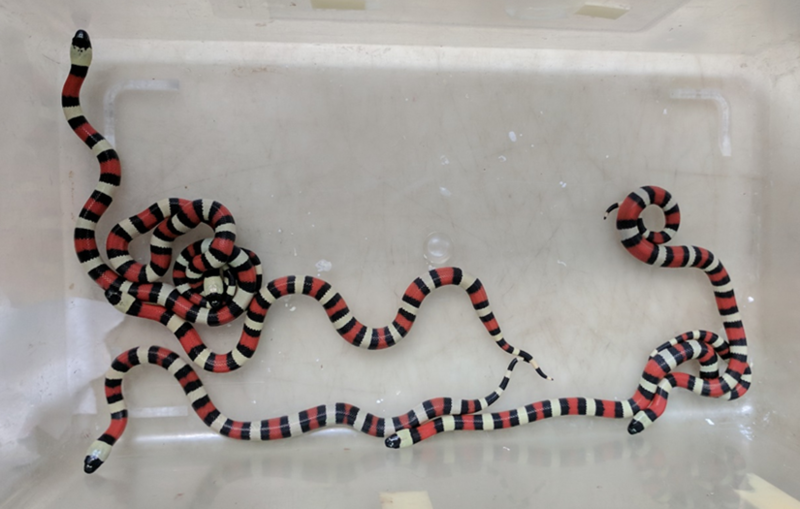 We had three clutches resulting in 16 baby Pueblan milk snakes this year! Right from the start, they have bright red bands which tell potential predators that they’re dangerous and to leave them alone. Here’s the fun part – milk snakes are completely harmless! They mimic the very deadly coral snake as a defense. So there you have it: all of the beautiful new additions to the zoo over the past year! Want to see more baby reptiles and amphibians? 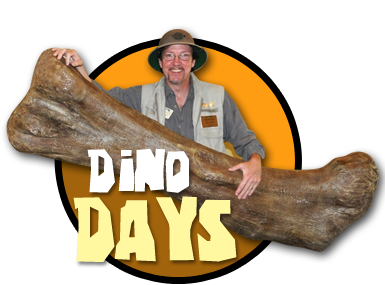 Check out our Behind-the-Scenes tours for access to Reptiland’s nursery!